No, Michael Vick has nothing to do with this column. This is purely about the National Basketball Association, and what we're going to see come the 2009 NBA Playoffs. Sure, the Magic, Nuggets, Trail Blazers, and Hornets are interesting, but come on. Spade a spade my friends, the trio in Boston, Mo Williams and a guy named LeBron in Cleveland, and of course the new king of Madison Square, Kobe Bryant, along with his Lakers, are the only real contenders. You can take that to the bank and cash it. I take great pleasure in introducing. . Rajon Rondo and the Defending Champs. You don't have to search far when looking to why the Celts are first to 40 wins, currently in the midst of an 12-game win streak, and show no signs of slowing down. Through 50 games, third-year guard, Rajon Rondo, is averaging three more assists per game than he was a year ago. That isn't just it, Rondo is scoring more points, creating more assists, grabbing more rebounds, and shooting a better percentage from the field. Some of Rondo's best games have come against the leagues elite guards. 15 assists against Chicago's super rookie, Derrick Rose. 25 points against Jazz guard Deron Williams, 17 assists and 16 points against Indiana guard T.J. Ford, and my favorite, 14 assists and 13 points against Maverick guard Jason Kidd. With Rondo's shot improving each day, the Celtics are becoming more dangerous than we could have ever imagined. Forget the two All-Stars, Garnett (17 ppg, 9 rpg) and Pierce (19 ppg), between Rondo and fellow All-Star snub, Ray Allen, the Celtics are off to one of the best starts in team history. Allen is shooting .497 from the field, good for tops among NBA shooting guards and shooting .411 from behind the arc, good for 9th among shooting guards. After their dismantling of both Detroit and Orlando over the past week, the Celtics are leaving no questions as to if their 2-7 record over 9 games in early January was just a fluke. Garnett, Pierce, and Allen are being Garnett, Pierce, and Allen, and with the play of Rondo this season, the Celtics could be more dangerous than they were headed into last years playoffs. No need to go over LeBron's mind numbing stats, he scores at will, can grab any board, and plays phenomenal defense. However, since LeBron entered the league at the start of the 2003 season, we've said one thing and one thing only: He needs his Scottie, or at least someone else. In just his sixth season, he may finally have that piece of the puzzle. He comes in the form of All-Star snub and 5th year point guard, Mo Williams. Williams is averaging 17 points a night and 4 assists while his running mate, LeBron, is putting down 27 a night with 7 assists. Williams and King James have the Cavs off to a 38-9 start including a 23-0 home record in Cleveland. Last week in Sacramento, Williams went for 43 points and a couples assists while shooting 13 of 18 from the field, and LeBron put in 20 while racking up 11 assists. Gone are the days where LeBron has to go for 38 in order to eek the Cavaliers out a win. In 47 games, point guard, Mo Williams, has gone for 20+ points seventeen times. 12 times, Williams has dished out six or more assists. More importantly, in their January match up with the defending champion Celtics, Williams helped hold Rajon Rondo to 5 points in 36 minutes. LeBron will also be able to get rest throughout the regular season knowing that Williams can be a second option in close games and allow him to gear up for the playoffs. Finally, the Cavaliers have placed a viable option next to Lebron, scary, considering he brought the Cavs to the finals on his own just a few years ago. Kobe scoring 100 points a night for the next ten nights still won't erase the fact that the Lakers could be without breakout center, Andrew Bynum, for the remainder of 2009. Since January 1st the Lakers are 13-4. Prior to January 1st, Andrew Bynum hadn't scored more than 19 points in any game this season, in January, he went for 20 or more 6 times and the Lakers were 5-1 in those games. In the five games before the injury to his knee, Bynum had 11+ rebounds in each of the five games. 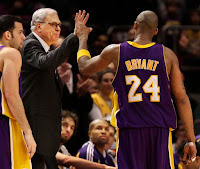 Just a week ago against Tim Duncan and the Spurs, Bynum's 15 points and 11 rebounds helped propel the Lakers to a 14-point victory. You watched L.A. reach the NBA Finals without Bynum in 2008, and you watched the Boston Celtics out tough them inside throughout the entire series, Bynum was supposed to be that band-aid and he's been turning it on all season. All that aside, if the goal was to get into the playoffs, be the number one seed, and work your way through the Western Conference, then the Lakers are more poised to do so than anyone else. With Bynum out, the Lakers will lean more on Lamar Odom, Vladimir Radmanovic, and yes, even Chris Mihm. Not many teams can look to the bench and have a 6-10 veteran who is averaging 10 points and 7 boards a game, the Lakers do that with Odom. Furthermore, the play of Trevor Ariza, (nine points, five boards), gives the Lakers second team a scoring threat, seventeen points off the bench against San Antonio most recently. While Kobe's 61-point effort in New York speaks volumes about what he is determined to do, I'm more concerned that the Lakers gave up 117 points to the Knicks and 66 points coming from big men Al Harrington, David Lee, and Wilson Chandler, seems like someone isn't as used to life without Bynum as we thought. The Magic recently suffering a huge blow with the injury of Jameer Nelson, and the Hornets uncertainty around the health of Chris Paul. I'm trying not to jinx myself by telling you the Spurs look too old, but between the Lakers, Celtics, and Cavs, this is a three-way dog fight. LET'S GET IT ON!